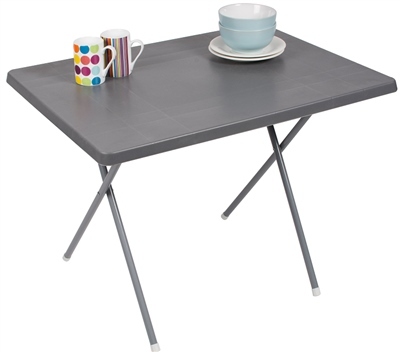 This lightweight fold away table has 2 adjustable legs for added flexibility and being very easy to keep clean. The Plastic construction provides a solid and lightweight base for the table top, as well as ensuring that this Table is light and easy to carry/transport. I needed a little extra table for a craft fair. I ordered this on the Monday and it was with me on Wednesday! Really pleased with the table and the delivery times. The table is ideal, light but quite sturdy too! I would definitely recommend this product! Only camp a few nights a year so didn't want to spend too much. This is cheap and cheerful but very light and easy to use. I wanted extra work top space and this was ideal. Not the most sturdy or durable but suits my needs perfectly. ok so the quality is not amazing but for the money its great. nice height for children to sit at in their camp chairs. very pleased.